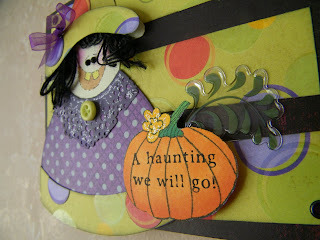 Pam Bray Designs: A Girl with Flair: Imaginisce "A Haunting We Will Go"
I created my "Haunting We Will Go" Halloween card using some of IMAGINISCE products that I had leftover from the card I posted yesterday. They are having a card challenge on their blog and you needed to make a card using the colors black, purple, green and orange and post your card here before Nov. 1st, 2010. I promised you yesterday that I had another card so here is my second card. I do have a Cricut but decided because I only had so much of the Dino Roar Primordial on hand I would just draw my witch and paper piece it. So I found a witch from an old tole painting book that I had on hand ,I drew it on to paper , cut it and paper pieced it together. Again I had to take the 5/8" circle punch and cover the brown circles with them so I would stay in the color family that was required for the contest. I used the Imaginisce Candy and Pumpkin stamps. The sentiment is on the Candy Stamp. I colored my images in with Copic Markers:YR04, YR07, GO5, Y19 and E35. I used Rouge Chalk to give my little Witch some color in her checks. Her flesh is actually a lite green colored card stock. I inked all of the sides with the Memento Tuxedo ink that I use to stamp my pumpkin with. Here is a little closer look at my witch and pumpkin. I added just a little Frosted Lace Stickles to the flower and the collar of the witch. My pumpkin and the brim of the witches hat is placed on pop dots. I placed a Fall Leaf Sticker behind the pumpkin. My hair is made from black string. I added just a few black eyelets to finish my card off. Love this card Pam! Your work is always a joy to see!! Hand drew the witch? Wowee, she's precious!!! Love what you did with stamp and clear sticker too. Thanks for playing along with us! 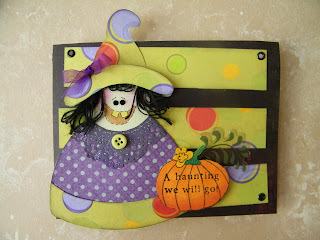 Pam this card is just amazing, especially as you hand drew the witch! Now, I don't know why you had trouble linking your second entry so I had a go myself and got it to work for you! Hope you don't mind? This is absolutely fabulous!!! Love what you did with the stamps especially!